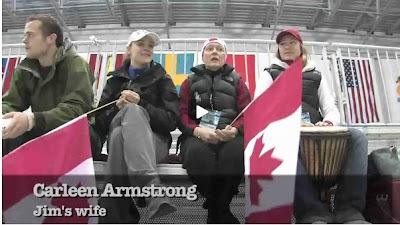 Wheelchair Curling Blog: Carleen Armstrong on wheelchair curling: "It's inspiring." Carleen Armstrong on wheelchair curling: "It's inspiring." During the 2009 World Championships I was able to procure access to Team Canada for a group UBC journalism students. The video of their visit is online HERE. It includes a comment from Carleen Armstrong, whose support for her husband and for the sport has been acknowledged in every conversation I have had with Jim. That picture actually has Jim's two daughters....Jayme (on Carleen's right side) is an actress working mainly in Toronto and New york, and Jody just finished Univesity in Halifax. Jim also has a son (not in the picture). They are just a great family.